Please be advised that the Fisheries Museum of the Atlantic has currently suspended all public research and image requests due to an ongoing collections move and archival development project. We anticipate that this work will be completed by 2019, at which point public services will be reinstated. In the meantime, we will continue to process time-sensitive requests if, and when, the requested materials are accessible and resources are available. We appreciate your patience and look forward to helping you again in the future. Remember a special vessel? Did your grandfather fish aboard a schooner? Want more information? Here's how to spend a few hours at the Fisheries Museum of the Atlantic and fill in some "historical" blanks. Most people who conduct research at the Museum are interested in one of two subjects: they want information about relatives or specific vessels. If you are interested in people - your grandfather or a more distant relative, for example - plan to spend a few hours reading records at the Museum. Did he fish from the ports of Lunenburg or LaHave? We have crew lists for a variety of years and ports. We also have census records for several areas from 1861 to 1891. By comparing families at these ten year intervals, with information regarding occupations, ages and religion, interesting facts come to light. If you want to research vessels, there are many sources of information at the Museum. 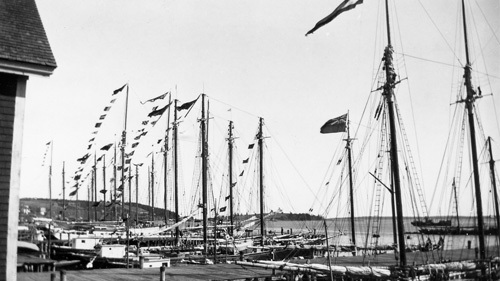 We have files on many of the better-known vessels from the Atlantic region. For other vessels, the best place to start is the Shipping Register. If you know when the vessel was built, look at the Shipping Register for the vessel's particulars and the names of the owners. Our holdings include the St. John's Shipping Registers, which provide information about the latter days of many Nova Scotian schooners. An added bonus for many vessel researchers is a photograph of their subject. The Museum has thousands of vessel photographs, with computerized records. We may be able to help you find a photograph to round-out your research! The Research Library and Archives section is open year-round, weekdays from 9:00 - 4:00 (holidays excepted). Because of the rarity of the collection, the Library and Archives is a non-lending facility. We strongly recommend contacting us before your visit, to ensure that the records will be fully available for your use. Do you have an object related to Nova Scotia’s natural, marine, industrial, or cultural history that you think should be part of the Provincial Collection?